It only took 100 days before Trump dropped all pretenses of being a people's president, and started making naked power grabs. Chump is tired of losing them thus far. This wasn't supposed to happen. Too much opposition. are very substantial and will not be questioned? This attitude was apparent the day he got elected. He was sure that as president he could do anything he wanted. That there would be no obstacles to his agenda. It seems just like yesterday when Chump decried President Obama's executive orders, suggesting they were an indication of a weak leader who couldn't bend Congress to his will. Trump is now admitting that he can't bend Congress to his will, but he blames the system rather than himself. In his two terms, President Barack Obama issued 277 executive orders, a total number on par with his modern predecessors, but the lowest per year average (35) in 120 years. Trump, so far, has signed 30 executive orders in 99 days. Just another flip flop for his corrupt regime. Whether Dump targets the filibuster specifically or not, his attitude toward his own power is clear: The more, the better. He's already gotten a taste for rolling back the filibuster, and after just 100 days of frustration, he wants more. 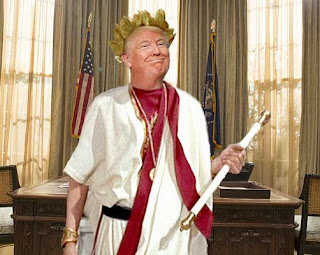 Now Rump is claiming the rules of the House and the Senate are "archaic" and need to be streamlined for the good of the country (translated: to further Stump's goals). In other words, just throw out the Constitution, which Donny Little Hands has never read. He wants a clear path to power and by changing Senate laws he sees how his agenda can go unopposed. If he pulls off a change like he's threatening to, it would be the end of democracy because the very foundations of the sacred document we call the Constitution will have been torn down. Vladimir Putin. Kim-Jong-Un. Rodrigo Duterte. Tayyip Erdogan and Abdel Fattah el-Sisi. A real rogue's lineup. And good company for Trump once he assumes complete power by destroying our democracy.